The incident had taken place on Thursday around 5 pm, when two men approached some of the victims, who were playing cricket in a vacant plot near the house, and allegedly asked them to “go to Pakistan and play”. Video grabs of the assault, captured on a family member’s phone. 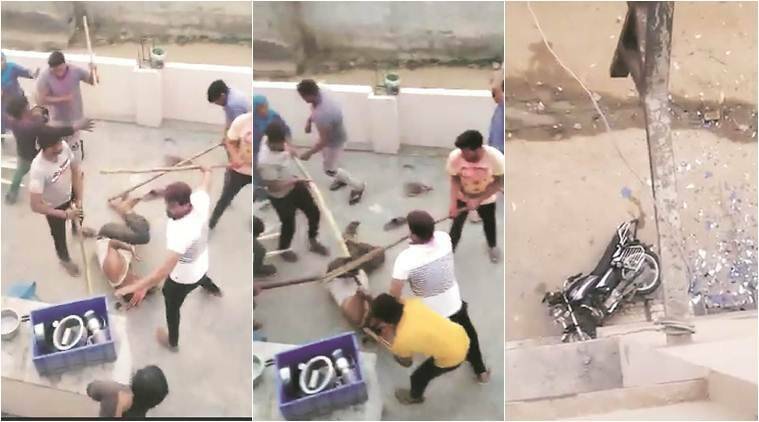 Three days after “20-25 men” barged into the home of a Muslim family in Gurgaon’s Dhumaspur village and attacked those present with rods and sticks, police arrested one more person for the crime on Sunday night. One accused had already been arrested on Friday. According to police, the man has been identified as Dhirendra alias Dhire (25), a resident of Naya Gaon. The first accused who had been arrested, Mahesh Kumar, was also a resident of the same village, located barely 2 km from Dhumaspur. “The accused was arrested around 9 pm from Bhondsi. During initial questioning, he revealed that he owns a dairy near Dhumaspur,” said PRO of Gurgaon Police Subhash Boken. Speaking to The Indian Express on Friday, Sameena, who lives in the house along with her husband Mohammad Sajid and their six children, had said that although she did not know the attackers personally, she “recognised one or two” of them as men who had opened a dairy in the neighbourhood “some days ago”. It was at this dairy that several of the men who formed the mob were sitting when Dhirendra received a call regarding the initial argument that culminated in the violence. “The accused revealed that after receiving the call, he roped in the others who were seated there and they went to the home of the victims, armed with weapons. Dhirendra also said he was carrying a spear…We believe he is the mastermind,” said PRO Boken. “He will be produced in court on Monday and taken into police remand for further questioning. We expect to get critical information about the incident, as well as the others involved, through him. Attempts are continuously being made to also track down and nab the other men involved,” he said. The incident had taken place on Thursday around 5 pm, when two men approached some of the victims, who were playing cricket in a vacant plot near the house, and allegedly asked them to “go to Pakistan and play”. As the conversation escalated into an argument, the accused summoned their accomplices, who allegedly reached the spot armed with sticks, rods, spears, and swords. They barged into the house and attacked those inside, which included Mohammad Sajid, his wife, and their six children, as well as relatives who had come to visit them on the day. “Mahesh was produced in court again today, with his one-day in police remand coming to an end, and sent to judicial remand,” said Inspector Surender Kumar, SHO of Bhondsi police station.